Cabinet spokesperson Rajitha Senaratne was in full damage control mode yesterday as he denied reports of President Maithripala Sirisena storming out of the Cabinet in protest, following an emotional outburst directed at United National Party members. 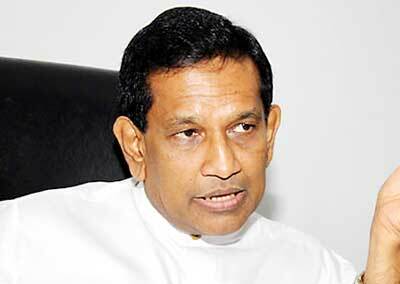 The Minister, speaking at the weekly cabinet briefing, claimed the President walked out of the meeting following the statement to “answer the call of nature”, not in protest, but he admitted that the President made a strong statement against criticism levelled at him by UNP MPs. Defending the President’s action, Senaratne said that Sirisena was disappointed as the criticism came from within his Government. The criticism came only after Sirisena appointed the commission to investigate the bond issuance and following some incidents that happened thereafter, Cabinet co-spokesperson Dayasiri Jayasekara said. However, the President on Tuesday asserted that the move was not to attack the UNP, but a decision taken to fight corruption, he said. “He said it hurts the most because the criticism is from within, not from outside. He would not have cared about the criticism from outside,” Senaratne added. Likening the relationship between the two parties in the Coalition Government to that of a cobra and mongoose, the Minister said that conflicts were bound to surface with time as the two archrivals form a national government. Prime Minister Ranil Wickremesinghe and a group of MPs, including Senaratne, had to coax the President to return to the Cabinet meeting. “The Prime Minister gave assurances that the UNP ministers or backbenchers would not criticise the President hereafter,” Senaratne told journalists. Coalition Government members of the Sri Lanka Freedom Party too have agreed not to criticise their UNP counterparts, Senaratne said.